How is Echigo Farm salad mix different? The answer is in the blend of greens, and the way of harvesting/packaging. Our mix features a seasonal blend of between 5 and 8 different varieties of ancient, traditional Japanese greens, chosen carefully for variety of texture and flavor as well as balance of nutrients. We also look for varieties which are easily grown here without the need for expensive and non-sustainable inputs. 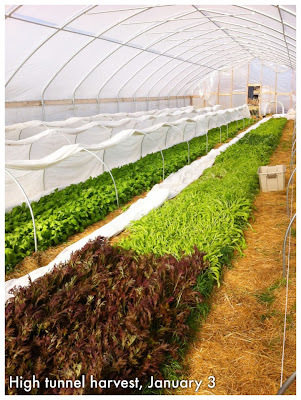 In the winter, we grow our mix greens in our high tunnels to provide them protection from the wind and cold, and extra warmth during the day. 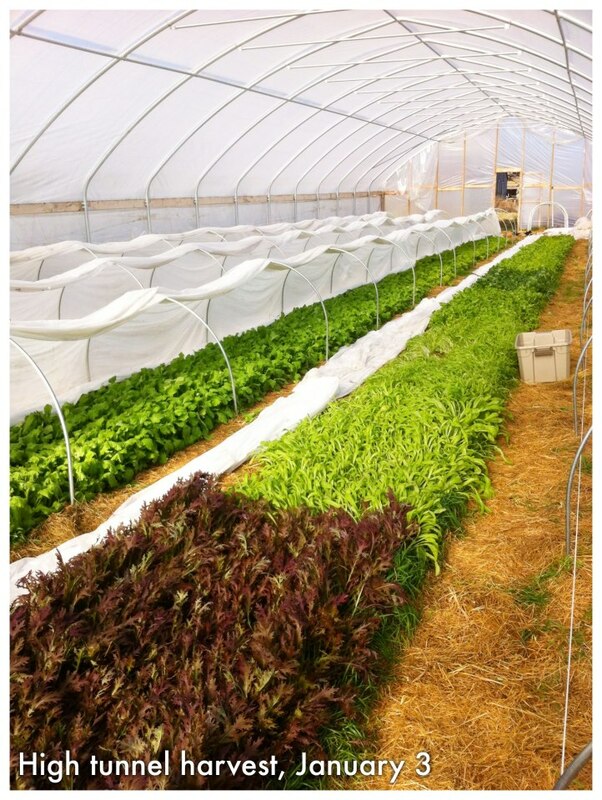 However, the greens in the tunnels are grown on the same natural, no-till, original soil beds that we use outside. We build our soil from the top down with organic rice hulls, sea minerals, fish emulsions, and other certified organic amendments. We also use cover crops and careful crop rotations to insure that our soils remain balanced and healthy. Because of the risk of e-coli contamination, we use no raw manures or other animal products in our soils. When harvesting the mix, we leave the greens whole and uncut, connected at the crown when possible. This keeps the greens fresher, locking in flavors and nutrients. Less processing and no cutting also means a reduced chance of contamination. We keep our greens as clean and simple as we can for your health, safety, and enjoyment. We pre-wash all of our greens when packing them; after cutting them for your salad, please lightly wash them again to remove any residual grit. As always, we never use any dangerous or synthetic chemicals on our plants or in our soils--you can be assured that Echigo Farm greens are clean and safe. sweet white baby turnip--slice up the turnip and the greens both in your salad. Together, this combination will provide you with a good supply of calcium, iron, magnesium, potassium, vitamins A, B, C, and K, as well as dietary fiber. You can use the mix in salads, stir-fries, or on tacos & sandwiches instead of lettuce. Mix in food processor or blender until smooth. Add a tbsp of tahini for a creamier, richer taste. You can also experiment with adding miso, ground sesame, and more.